Fans of the feline will stamp Christine Schmidt's whimsical cats on...everything, really. For some people, there can never be enough cats. You can tell those people by the cat hair on their clothes, the cat videos they post on social media, and, well, they tend to talk about cats a lot. They'll purr with delight when they get their paws on Christine Schmidt's whimsical, artistically designed stamps that they can stamp everything with. Gift tags, wrapping paper, snail mail, invitations, shopping and to-do lists, their hands, their face, your face...all in neon pink, the color in the ink pad. (Who are we kidding? Those people are us. We are them. These cats are stamped on our hands as we type these very words.) Made in Mexico. To clean stamp, wipe with damp cloth or paper towel after stamping. Just as cute and vibrant as the picture! They are used the sane as any other stamp; press the stamp into the ink then onto the paper. The ink is so vibrant and pretty! I always assume photos of any type of art supplies will be overexaggerated, but these stanps came out just as vibrant as the picture. And they are soooo cute!!! 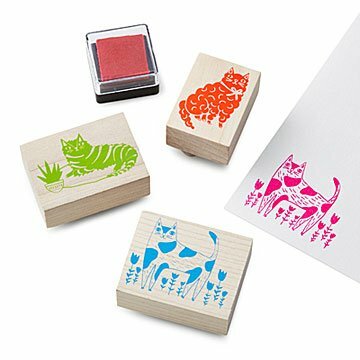 Adorable set of cat stamps, great for adorning cards and notes. Love them! Super Cute, Great Customer Service and Fast Shipping!